When the crowd is lining up the parties and the weddings with their usual denim-shirt-blazer or khakis-shirt-jacket combination, you can choose to stand out donning our old traditional attires done up in the right way. 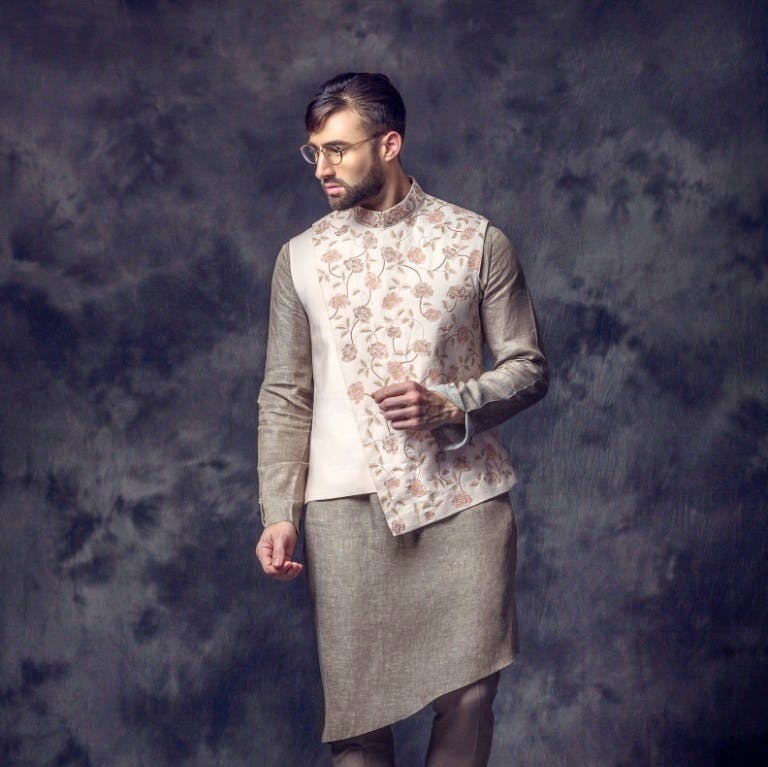 Label Poonam Kasera is a thing to reckon with for traditional menswear, and we suggest you give it a try. Bandhgalas in bold cuts to heavy embroidered kurta and churidar, label Poonam Kasera's rich traditional outfits will keep you wedding and party ready for the season. Fusion clothing may be cool for some, but it's an old story now, tbh. This part and wedding season amp up your look going back to our culture. Retro is hot this season, and it can't get better if as the groom's best man you don up in Poonam Kasera's navy blue velvet bandhgala with pearl buttons and team it with white silk churidars. But if subtlety is your keyword then check out her purple (wine is another hot colour this season) textured bandhgala that goes fabulously well with slim tapered trousers for a razor sharp look. For a more bold and classy look go for the overlapping double-collared silk kurtas or the shirt-styled kurtas and pair it up with churidar or pathani. Accessorize it right with the label's embroidered stoles, pocket squares or jootis for a complete look. The label's stunning linen kurtas with asymmetrical cuts and chest pocket flaps are also a thing to watch out for your winter parties. Team them with the heavy embroidered jackets and fitted narrow trousers and you'll have a look to make a few men green. Your purse will definitely feel a lot light after splurging in on this label (the basic kurta-churidar set begins at INR 12,000), but then wedding and party wears are not regular things and can be worn on different occasions over a period of time. It takes around 10 days for a basic kurta and churidar set to be delivered, hut the more heavy embroidered ones require at least 15-20 days for delivery.